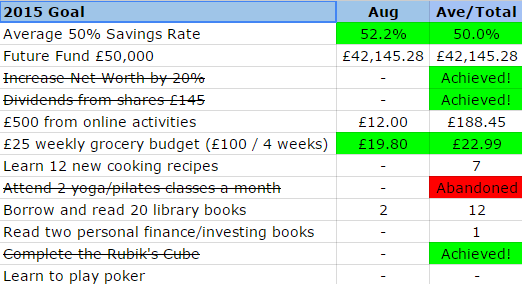 A savings rate of 52.2%, which is my second best this year! This takes my average back up to bang on 50%! I will savour this rate right now because I can assure you that it will be dropping dramatically over the next few months due to a change in priorities, which I will explain in a future post. This month’s savings was topped up with £12 from TopCashback*, £6.24 reviewing music (and occasionally, ladies fashion!) with SliceMyPie* and £50 from rent received. Also, note that the above figure includes £500 that is now sitting in my investment account ready to purchase the shares I picked in York for my Monkey Portfolio! Since I get paid in the middle of the month, I’ve had to use August funds for the investments to take advantage of the regular investment service. The global market has been all over the place this month and it has been pretty tough looking at all the red numbers. I haven’t been tempted at all to sell my investments though or regret my investment decisions. Unfortunately, I didn’t have spare cash lying around to take advantage of the big dip in the market. 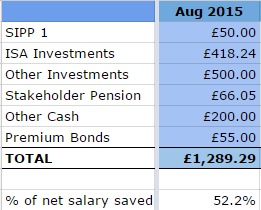 My Future Fund now stands at £42,145.28, a slight drop of £336 from last month. If you factor in what I saved this month, then it’s a bigger drop but nothing to get me sweating or worrying needlessly. To get to my year-end goal of £50k, I’ll need to get an average increase of at least £1963 per month over the next 4 months. A rather big ask that is dependant on the markets and my savings rate but let’s see what happens. Net Worth is now £112,245.84, an increase of 25.8% so far from the start of the year. I will now divert my old monthly car payments towards investments but will also be putting some towards a ‘maintenance fund’ to cover any unforeseen repairs and also some towards breakdown cover, which I previously got free as part of my loan repayments. I received £10.68 from De La Rue, £10.97 from Vodafone, £3.18 from British Land Co, £2.85 from City of London IT, and £1.76 from Bankers IT. So a total of £29.44, bringing my monthly average now to £22.82. Next month, I will be able to do my first year on year dividend income comparison! Dividends received in 2015 now total £182.57. Oh, I also received another £50 P2P referral from Funding Circle, thanks to Graham! I topped up my holding of BHP Billiton plc and also picked up a few shares in Bloomsbury Publishing Plc (BMY) to use up a bit of tax reclaim sitting in my SIPP. Unfortunately, both purchases were made early on in August before the drop in share prices…ah well, such is life! Food/Groceries Budget – I spent only £79.18 this month, averaging £19.80 per week. I’ve been making use of food that’s in my freezer, which has kept costs down, plus I shopped less as I wasn’t at home most weekends. My average weekly spend so far is now £22.99 so still on target. Cooking Recipes – I didn’t manage to learn any new recipes this month, so will have to catch up next month! Online Earnings – Still very much behind on this one but a small amount came in this month from TopCashBack as listed above, bringing my total online earnings so far this year to £188.45. I have about £90 in the cashback pipeline, which I will log as it gets paid out but sadly, I’m nowhere near my over-optimistic £500 goal. Library books – Two books borrowed and read this month. 12 books borrowed so far, so I’d say I’m still on track to hit my target of 20 library books by the end of the year. Two greens, in particular my savings rate, makes this a very good month! I’m currently working on reading my ‘personal finance/investing book’ so hopefully this is a goal I can cross off next month. Hope everyone had a great August and bank holiday (if in the UK). This entry was posted in Books, Dividend Investing, Funds, Net Worth, Portfolio, Savings, Shares by weenie. Bookmark the permalink. Hopefully the extra saved from your car payments can keep your savings rate nice and high in the coming months. It's a good call on keeping some back just in case the engine falls out or other similarly disastrous act of god. That swathe of green on the goals has got to be feeling pretty good Weenie! I'm in the reverse process to yourself of stocking up the freezer at the moment – the allotment courgettes keep on coming and the soups keep getting made. Am now wondering if there's some reverse condition to scurvy that's caused by eating too much green veg! Pretty solid numbers all around. We made this amazing chicken kale barley soup the other day and it was delicious. Love making new foods and try them. Thanks Tawcan. Unfortunately, I wish I did love making new foods but for some reason, I don't have a great interest in cooking and I've set my goals to force myself to do something! That soup sounds great! Yes, it's good to see all that green, especially as all I've been seeing are red numbers when I look at my portfolio! Like you, in the bad old past, my car repairs ended up on my credit card – that was part of my debt problem so I don't want to go there again! Re: Monkey Stocks, yes, I was thinking of doing the odd transaction. When the shares are purchased, most portfolios are going to have surplus cash, which can be used to buy more shares. For the virtual ones, if people tell me which of their existing shares they wish to purchase, I will 'buy', deducting the £1.50 fee and stamp duty. I will of course be doing it for real but the calculation should be the same. Does mean that's not automated but otherwise, there will just be a wad of money sat there, unless that's what people want! 52.2% savings rate, awesome progress and more money invested, your dividends are starting to grow and should make you feel good as you can now do your year to year comparison. A smashing August indeed 🙂 Your food spending in always impressive. Miss FFB40 is correct – Courgettes practically throw themselves out of the ground. We intended to plant two this year but one fell victim to the late frosts, however we've found that one has been more than sufficient! (in previous years we had 3-4 on the go and neighbours were continually surprised to find Courgettes on the doorstep). Allow about 2ft x 2ft per plant. 10) Freeze them to enjoy later! I'll definitely give growing courgettes a go! Thanks for the recipe idea! Thanks and yes, I am very excited about being able to do a year to year comparison. The dividends should continue to grow slowly but surely! Thanks! I think I could shave off more on my shopping if I put my mind to it (eg M from There's Value halving her grocery by following meal plans) but I'm comfortable with what I am buying right now, even though I do have to work at it and remind myself as I am going along the supermarket aisles! I'm currently reading 'Think and Grow Rich' by Napoleon Hill. Only a few chapters in but it seems ok so far. Yep, am very happy to have repaid the car, felt a big sense of relief! Great going weenie – you must feel especially good about paying off the car. You've been under-recording your previous net worths because you've been including the full initial amount of you car loan of £3,462 instead of reducing its balance each month (as you would with a mortgage). This month looks as if you've suddenly found £3,462 to pay it off when in fact you've just made the final payment . Your net should have dropped this month (like mine). You can't fool us , you know! Anyway, keep up the good work (I'm rumbling along a little bit behind you on NW) ! Thanks for stopping by and looking at my numbers/calculations! I have been reducing my car loan by £147.95 each month. At the start of the year, the loan outstanding was around £4.2k. I've always made a note on my detailed net worth updates that there was a final ‘balloon’ payment of £3,166.25 required to clear the loan. Had I not made this final payment in full, I would have had to hand the car back. I think I’ve caused some confusion when I decided to remove money I had put aside for the repayment of the loan (that had been sitting in my cash ISA) from my figures and put it in my ‘Emergency Funds’- I mention it here in my post from a year ago: http://quietlysaving.blogspot.co.uk/2014_09_01_archive.html?_sm_au_=iVVPFPFQFkk0vv4P. My reasoning was that I didn’t think the amount belonged with my long-term savings/investments because I was knew I was going to ‘spend’ it. However, I see now that rather than remove it completely from my updates, what I should have done was just 'move' it so that it was no longer a part of my Future Fund, but still included in my net worth, plus the amounts that I’ve been making to make up the £3,166.25. So you are correct in that my net worth shouldn't have jumped up by that amount as if I’d conjured the money from thin air! I apologise for the confusion! Currently, my Emergency Fund stands at zero but I intend to start to top it up, so I will include it in my net worth figure. From next month in fact! Thanks very much for stopping by and posting so that my updates will make more sense in future! Thanks and yes, it's a great feeling now that's gone. You're making actual purchases and as it's free, you can count it as free! 🙂 Just let me know the numbers when you've bought them! please make me some! that sounds delicious! may I chip in and say check out this recipe for courgette scones. For the first time in ages, I didn't grow courgettes this year, but everyone else in the neighbourhood seemingly did, so there's literally not been a week this summer without a neighbour having a basket of FREE courgettes outside their front door. Thanks for the courgette bread idea – I'm going to have a go this weekend! That is a fabulous saving rate! Your net worth is much better than mine too so go you. Wishing you even greater riches. Thanks for the kind words, Laura. Hope all is well with you. Way to go Weenie, your savings rate is doing great. Thanks for the mentions on car savings fund and the meal plans. I was just saying to the Fibrarian, that we've spent £12.91 on food this week. That included 4 extra items that weren't on Thrifty Lesley's list for this week too. I can honestly say that I am a bit stunned at spending so little on food… it's going really well and will hopefully push our own savings rate up too! Thank you very much for giving me the idea to put aside funds for my car maintenance and also pointing me to Thrifty Lesley's. I did my weekly supermarket shop earlier and I spent £17 – the food will last me all week, covering my evening meals and all my work lunches – I think I have this sussed now but I must continue to monitor it, as I think it will be easy for me to relapse back to the bad old days of spending too much on groceries. Your 50% reduction on your own groceries is phenomenal – keep up the great work! Thanks for your continued support and kind wishes. Impressed you managed to save >50% with all that going on including the York meetup! Thanks TFS. The gym rebate helped a lot with the 50% and my food shopping for that month was particularly low as I was away most weekends.Also, York is a lot closer to me than it was for you! Good luck with your figures!